The road of life has so many twists and turns that there are days it feels more like a roller coaster than a road that you are on. Each of us have our own path we must follow in life. It is a path we create from our choices and decisions, or sometimes a lack of choices or decision which draws us in a new direction. I find myself looking at the path I have traveled before today which led me here, right here, right now. I see some misguided turns I have made, but mostly I can say I am proud of the roads I have taken in life. Unfortunately I have hit a few roadblocks which have slowed me down, actually they have brought me to a sudden halt in my life. People are quick to judge and question you about the way you lead your life, but what right do they have to do that? Basically it is because they are viewing YOUR life from THEIR eyes. They can only see through the view they have chosen to take on their path and if it doesn’t match your view, they question it. Maybe out of disapproval, maybe out of envy. But either way, its not for them to say. 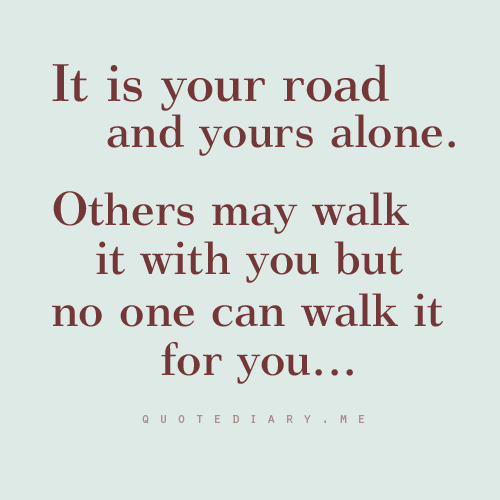 Your path is yours and that is how it should be.